How do I host three events in March? I don’t know how I got into the event’s industry, find the time to organise/promote them or even where I get the energy to be there and help out – but I do know that I am passionate about all the topics being discussed, meeting people AND Making a Difference in a BIG way. And TEAM: Together Everyone Achieves Miracles! Events are for property investment, internet marketing and youth coaching. Please come along and check them out if you are interested and in Huddersfield, Leeds or London on the following dates. Speakers and hosts are Steve Foley, John Lee, Vincent Wong, Amanda Brown, Dwayne Kerr, Harry Singha, Michelle Cairns, Rachel Leigh, Michelle Pyman, Emmy Yeadon. This March we have Wealth Dragons and good friends John Lee and Vincent Wong coming to speak to us about a great new way of investing using Lease Options. Property millionaires and authors of the first book on Lease Options in the UK, they say you too can become financially secure within 12 months. The secret lies in knowing what strategy to use in any market conditions. If you can afford to buy a TV, you can afford to buy a house and build a multi-million pound portfolio. Also Amanda Brown from PDS – Planning and Development Solutions. Amanda is an Accredited Landlord and has a portfolio of 4-6 bed houses in Leeds that she multi-lets. She will be speaking regarding the proposed changes to the class system with regards to HMO’s (Houses of Multiple Occupancy), and how to reduce your risk now and in considering the purchase of further properties for rent. PDS also advise landlords on conversion to flats, HMOs, bedsits regarding enforcement / applications / appeals and making the best of their portfolios. Success with the internet is not easy. For YOU to become a successful full-time internet marketers you must set aside TIME to associate with other successful internet marketers. You’ll have the chance to question each of our Internet Experts when you attend one of our regular internet networking events held across the country. * A special “How To” nuts and bolts Q & A ask the experts session on using Social Media success strategies. * You’ll get to rub shoulders with active “UK BASED” internet marketers. * The chance to share your business ideas with real people who will know how to take it forward. * Pick up useful tips that could show you the difference between an online success and an online miss. * Get access to a wide range of JV partners in many online niches. Presented by Youth Coaching Academy’s Harry Singha – A special day for young people, teachers, parents and coaches. The Academy’s Highly Acclaimed One Day Version of The Essential Youth Coaching Skills Programme For FREE!! That’s Right,You Can Attend This Programme Delivered By Harry Singha Himself, As Our Guest! The Event is sponsored by a group of Individuals from around the Leeds area. The course retails at £150 per person and we are delighted to announce that we are sponsoring this event. So you get the training and workbooks for FREE and all we ask is you pay £10 to cover the cost of the venue. We are teachers, parents, youth coaches and local entrepreneurs with one thing in common: We are really passionate about young people and personal development! c) Create a workable plan to get there! Have you heard of life coaching and wondered why it seems only available to celebrities and executives and in the main to adults? That’s the exact question Harry asked himslef when became one of the UK’s first accredited Life Coaches in 1999, when he commited to a mission of making Life coaching more accessible for young people around the world, by training young people and those who care fro them to become coaches! Fact there are tens of thousands of trained coaches in the UK now and the research and evidence of its effectiveness is mounting. The DFES and the National College for School Leadership are all acknowledging and promoting the use of coaching within education establishments. Simply put coaching is a powerful relationship for supporting an individual/group to bring out the best in themselves. We are passionate about supporting the personal development of young people in the North of England and beyond. In our commitment to the above we are delighted to announce the realisation of one of our objectives bringing Harry Singha, Chairman of the International Youth Coaching Academy, the pioneers of Youth Coaching. o How to use a universal coaching model to support anyone to identify a Goal and then identify where they are in relation to it and then take some steps to move towards it. o How to take any issue and end up with an action and a celebration for dealing with it. The course offers all participants practical skills to be able to use immediately and confidently. As you have already shown an interest in property, business and being financially free, we have negotiated an unbelievable opportunity for you, and it won’t cost you an arm and a leg. On 2nd – 5th July, 10 of the World Best Internet Legends will be in London to teach you the Secrets of Internet Wealth at the Global Internet Seminar. So while companies continue to wind up, and people are losing their hard earned money and their jobs, there’s a group of very successful Internet Entrepreneurs who are secretly and quietly laughing their way to the bank & making truckloads of money on the Internet! I’ve arranged for you to get in to the whole 4-day event for Only £30! This offer is literally priceless to you. Other people are paying up to £997 for the same event. Please don’t miss out on some of the finest Internet Education ever created. So go ahead and grab this irresistible OFFER now while there are still some spaces left – this is going to sell out so quickly. 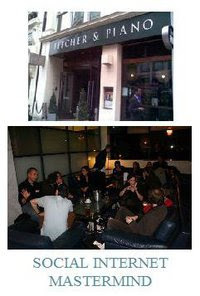 Click here: www.gis.networkbillionaire.com to book your place and I’ll see you there. P.S. Hurry this is going to be a ‘sell-out’ – get your massively discounted ticket now, before it’s too late! What if we were to grab you by the shirt, force you to sit down in a room the same group of world class internet marketing legends and get them to spill the beans on all their latest profit pulling secrets on how to make money online? …And to guarantee your success and make sure you can’t fail, give you your own website ready to go, already established in a hot-selling market? Meet The Internet Legends Who Don’t Give A Damn About The Current Economic Recession! Early Bird Special Bonuses! 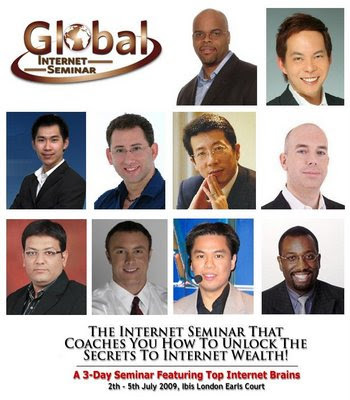 Be One Of The First To Book Your Ticket to “Global Internet Seminar” And Get some free bonuses as well! We don’t just look after you, we REALLY give you value for your money and time.